The price per person is $75 for the full day horseback adventure from 7:40 a.m. to 2:30 p.m. The half day horseback riding tour is $65 per person from 7:40 a.m. to 12:30 p.m. 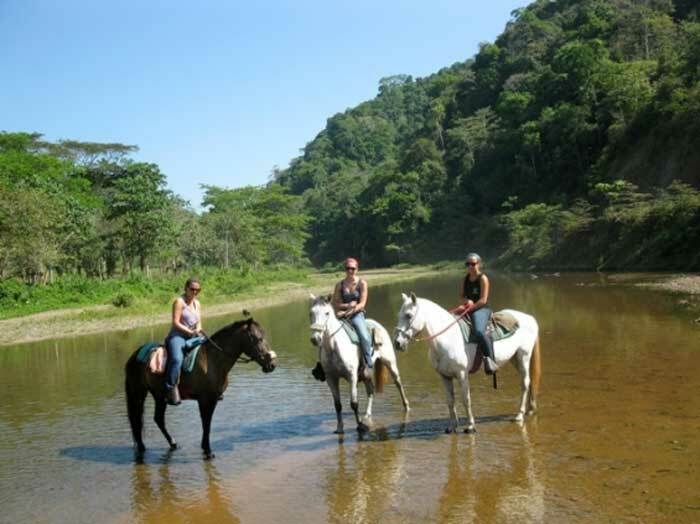 The Horseback Riding Manuel Antonio tour is a favorite amongst visitors because of its beautiful scenery that you get to view during the entire excursion. Plus, there is an amazing waterfall where you can enjoy some time to swim and relax. The tour includes lunch, fruits, snacks, and drinks plus round trip transportation. This is a must to do here in Manuel Antonio, Costa Rica as the scenic views are really amazing. The ride to the waterfall is a lot of fun and this is an activity that can be enjoyed by kids and adults. The horses used for the tour are well trained and the harness is safe for you and for the horse. This is a perfect way to get away from the crowded areas which you will find in Manuel Antonio, especially during the high season. The horseback riding adventure in Manuel Antonio, Costa Rica includes round trip transportation, breakfast, lunch, drinks, fruits, snacks, bilingual guide & the best breed of horses. We will pick you up at your Hotel or Villa and from there we will head towards the mountain estate where you will be greeted by one of the horseback tour guides who will give you an explanation of what to expect and tips on how to properly ride the horse. Once you are on the horse, the journey begins by taking a short horseback ride through a beautiful Costa Rican Mountain Property where you can also encounter a wide variety of birds, frogs, and lizards. After about 1 hour, you will arrive at the Waterfall which will take your breath away and you can enjoy a great swim in the waterfall which makes the horseback tour even more special. We recommend you bring long pants, comfortable shoes, extra clothes to change after the waterfall, mosquito repellent, and as always a good and positive attitude.